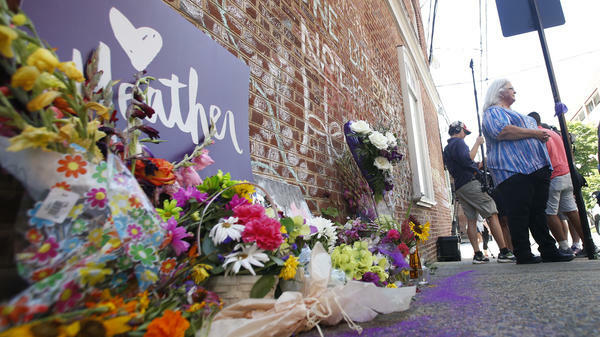 A memorial to Heather Heyer — who was killed at last year's Charlottesville rally by a driver facing murder and hate crime charges — stands at the site of her death. Heyer's mother, Susan Bro, is in the background. 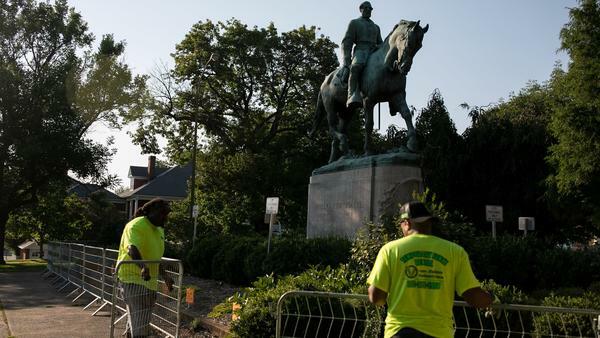 Workers enclose a statue of Robert E. Lee near downtown Charlottesville, Va. The statue and the park in which it's located were the center of last year's Unite the Right rally. In downtown Charlottesville, Va., authorities are limiting car and pedestrian traffic, dozens of police in riot gear are patrolling a park in the city's center and some residents have left town in case the weekend turns violent. Sunday is the first anniversary of the deadly Unite the Right rally, the white supremacist march that boiled into a chaotic clash between protesters and counter-protesters, injuring dozens. NPR's Debbie Elliott reports that memorials have been planned throughout the week. University of Virginia students will march on their Charlottesville campus Saturday night, Debbie tells Scott Simon on Weekend Edition Saturday. "They are reclaiming that space because last year white supremacists came with their torches and took over that part of campus." At a service Saturday morning, the university's president apologized to students who were attacked last year. "This group of marchers represented an extreme group of lost souls who want to reject our values and aspiration," Jim Ryan said. Hawes Spencer of member station WCVE reports that Ryan's speech started solemnly, but ended optimistically: "We are in this together," Ryan said. "My deepest hope is that in the months and years ahead we will truly feel like we are in this together." People across the country are marking the event's anniversary. Virginia Gov. Ralph Northam said the rally "reawakened our commitment to fight back against that ugliness of racism and bigotry." President Trump — who a year ago faced widespread condemnation for blaming the violence on "both sides" — wrote on Twitter Saturday morning that the protests had "resulted in senseless death and division" and that he condemns "all types of racism and acts of violence." The mother of Heather Heyer, the 32-year-old woman who was hit by a car and killed last year, has also spoken publicly leading up to the anniversary. Susan Bro tells NPR that her daughters' legacy is a call to action. Bro's desk at the Heather Heyer Foundation sports one of Heyer's favorite sayings: "If you're not outraged, you're not paying attention." The man accused of killing Heyer faces murder and hate crime charges. Ahead of the weekend, it was unclear whether white supremacists would try to reprise the rally. Gov. Northam declared a state of emergency in advance, allowing Charlottesville to have a heavy police presence. The founder of last year's event organized a march Sunday in Washington, D.C., to mark the anniversary. Last month, a similar rally in Portland, Ore., resulted in four injuries. Police declared it a riot after far-right protesters and members of antifa, the far-left group that calls itself anti-fascist, began launching fireworks, rocks and bottles at each other. The uncertainty leading up to the anniversary put some people in Charlottesville on edge. One resident, Anne McKeithen, tells Debbie she plans to leave town. "It's so fraught with what's happened that I feel I need to be away this weekend," McKeithen says. "It's just too frightening to be here, not knowing what might happen." But on Saturday, Charlottesville appeared more contemplative than chaotic. Last year's rally exposed a racial divide in the city, Debbie says. "It has people talking now. It's also energized activists who are intent on fighting hate and not letting Charlottesville become some sort of shorthand for racial strife." "Charlottesville isn't a hashtag. Charlottesville isn't something that happened," a local minister, Brittany Caine-Conley, tells Debbie. "Our community experienced a white supremacist terrorist attack, and we are resilient and we continue to fight white supremacy here every day."